Yellow graphic overlay created by Earthfiles viewer Steve McMath based on Michael Reed interview and drawing below in this Earthfiles report. 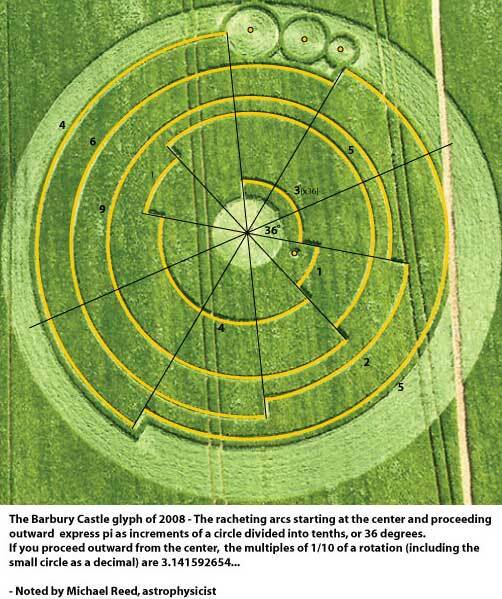 Barbury Castle barley crop formation near Wroughton, Wiltshire, U. K., reported June 1, 2008, 300 feet in diameter. Aerial image © 2008 by Lucy Pringle. June 8, 2008 Timberlake, North Carolina - On June 7, 2008, I received the following email from a man who retired from an astrophysics career and is now a semi-retired technology consultant for electronic and electro-optics industries living in Timberlake, North Carolina. Mike Reed once worked at the University of Arizona in Tucson on the Multi-Mirror Telescope (MMT) at Mt. Hopkins, a joint venture with the Harvard Smithsonian Observatory. 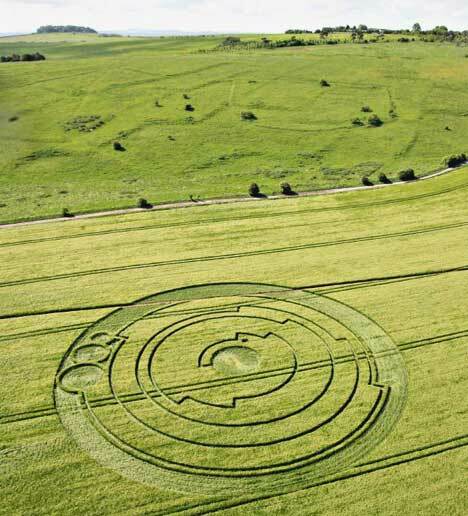 He had been studying the June 1, 2008, formation in barley at Barbury Castle.